In this month’s Teacher’s Corner, we will explore the world of journalism and the job of reporters. Each week will provide students interesting and engaging opportunities to practice the basic skillset that all journalists have. In this month’s Teacher’s Corner, we will explore the world of journalism and the job of reporters. Each week will provide students interesting and engaging opportunities to practice the basic skillset that all journalists have. Each of the activities included in this month’s Teacher’s Corner provide students practice in working with the ‘5 W and H’ questions that serve as the foundation of journalism. Students will practice asking Who? What? When? Where? Why? and How? which serve as the center of any effective newspaper report. Each activity this month provides students a context to practice asking questions and dig for information in order to create news stories about the people and places important to them. Week 4: What’s the Scoop? Week one begins the month with an activity centered on the Inverted Pyramid. 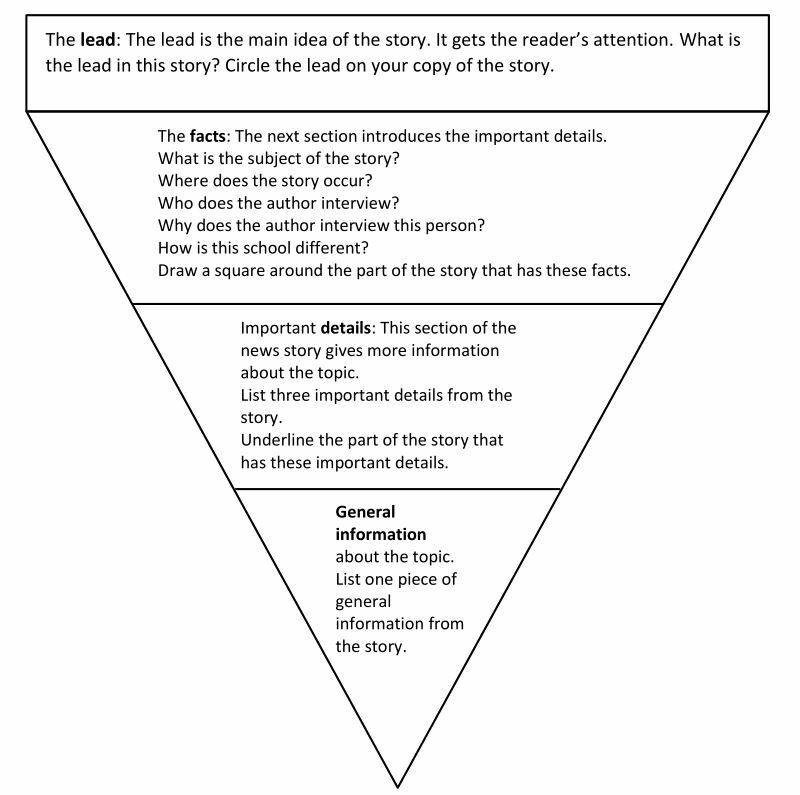 The Inverted Pyramid is a style of writing used in many news articles; students will practice identifying the parts of the pyramid. Week two features an active-reading activity where students can practice identifying important questions in a news story. Week three encourages students to play the part of a reporter and conduct a celebrity interview. Finally, this month’s Teacher’s Corner concludes with students working to produce their own news radio broadcast. For more on journalism and the media, check out the American English MOOCs (Massive Open Online Courses) for English Language Learners: English for Journalism MOOC and the English for Media Literacy MOOC! In this week’s Teacher’s Corner, students will work on understanding the parts of a news story. This week’s activity uses a graphic organizer about the inverted pyramid. The inverted pyramid is a journalistic writing style that places the important information at the beginning of the news story and more general information at the end of the story. Read the article Experimental School in California Has No Homework and listen to the audio version of the story. Print out the Inverted Pyramid worksheet in Appendix 1. Make enough copies so that each pair of students in class has a worksheet. Print out the news article Experimental School in California Has No Homework in Appendix 2. Make enough copies so that each pair of students has a copy. Begin the class by telling the students they will read a news article about a school with no grade levels and no homework. Ask the class, “What would a school with no grade levels or no homework look like?” Have the students do a think, pair, share. Next, instruct the students to get out a piece of paper and a pen or pencil. Play the audio version of the article Experimental School in California Has No Homework. As the students listen to the article, have them take notes on the information in the article. After listening to the article, have the students form pairs. In pairs, have the students compare the notes they took about the article. Have the pairs share their notes with the class. The goal in this part of the activity is to understand what details the students understood in the article, so answers may differ among the pairs. This is okay. Begin this section of the activity by having the students form pairs. Next, give each pair a copy of the article Experimental School in California Has No Homework found in Appendix 1. Have the pairs read the article. As students read, circulate around the room to help students with any vocabulary questions they may have. Once the students have completed the reading, give each pair a copy of the Inverted Pyramid worksheet in Appendix 2. Have the students work in pairs to answer the questions on the worksheet. Note: The worksheet has four sections that match the sections of the news article. The lead: This is the text between the main title and the first subtitle. The Facts: Most of the major facts of the story can be found under the subtitle No Homework. Important Details: The subheading Personalized learning contains the important details of the story that explain the information in the facts section of the story. General Information: The subheading Work in progress contains the general information about the story. This information adds extra details, which are not critical to understanding the story. Once the pairs have completed the worksheet, have them join another pair to form a small group. Have the pairs compare their answers to the worksheet questions. Once all the small groups have compared their answers, have them share their answers with the entire class. For more on journalism vocabulary, check out The Lighter Side – Journalism Crossword! Directions: Read the article Experimental School in California Has No Homework. After reading the article, answer the questions in the graphic organizer below. This week’s Teacher’s Corner prepares students to practice journalism skills. Many news stories follow a specific structure that makes writing and reading them much easier. This activity allows students to practice deconstructing, or taking apart, a news article to explore the sections of a news story. This activity can be used separately, or can build upon the ideas presented in Week 1 of this month’s Teacher’s Corner. Prior to class, read the story Skateboarding: A Tool for Cultural Diplomacy? The story includes a video at the top of the page as well as an audio transcript of the story. Both of these will be used in the activity. Print out the News Story Jigsaw Cards in Appendix 1. Make one copy of the materials in Appendix 1 for each team of students. Be sure to cut out the text boxes and then mix up the sections before passing them out to students. Begin the class activity by asking students if they skateboard. If any of the students skateboard, have them explain to the class what skateboarding is. If none of the students skateboard, then go straight to the video. Next, play the video Naftalie Williams: “Skateboarding: A Tool for Cultural Diplomacy.” At this point the students do not need to take notes. Have them watch the video to see skateboarding in action and hear some of the details that will be presented in the news article. Note: If students are familiar with skateboarding, the video can be skipped. However, if students are not familiar with skateboarding, the video provides a helpful visual aid to show them the sport. Begin the class activity by having the students form pairs or small groups. Each group should be between two to four students. These groups will work as a team for the entire activity. Give each team the News Story Jigsaw Cards in Appendix 1. Provide the class a few moments to read through the sections of the story. Next, play the audio version of the story. Have the teams listen to the audio version of the story. As they listen, the teams should arrange the News Story Jigsaw Cards in the correct order. After students have placed the parts of the story in order, play the audio again so students can listen and follow along. Tell the students that an effective news story includes the answers to those questions because they answer all the basic facts a reader will want to know. Next, tell the pairs/small groups to take out a sheet of paper and a pen or pencil. Working in their pair/small groups, have the students read the story again and identify the answers to the “Wh” questions and the “How” question listed above. a. Note: During this first step, the pairs/small groups can keep their answers simple. For example, in response to “Who?” students can write Neftalie Williams. For “What?” they can write skateboarding. Once students have identified the basic answers to the questions listed in step 1, have them read through the story again. This time instruct them to underline parts of the story that answer the “Wh” and “How” questions listed above. a. Note: The goal in this step is to get students to engage in active reading. In active reading, students do more than read and memorize the details of a story. Instead they work to understand the meaning and purpose of an article. Once the teams have completed step 4, review the answers with the entire class. Go through the “Wh” and “How” questions one-by-one and have the different pairs/small groups share their answers with the class. For homework, have the students write a paragraph or small essay. In the assignment, have students write about their own hobby or activity they would like to share with the world like Neftalie Williams does with skateboarding. For more on working with the “5 Ws and H” questions check out Using Journalism Skills in the Language Classroom. Skateboarding involves riding and performing tricks on a small oval board attached to four wheels. It can be considered a recreational activity, an art form, or a method of transportation. Neftalie Williams says skateboarding is his passion. As a young adult, Williams gained a larger view on skateboarding. “Right when I got to be about 20 years old, that's when I decided that not only was skateboarding important, but it's something that I should really, really be involved in --- not just working on being an amateur sponsor skater, but that skateboarding meant more to more people and it was a way to sort of connect communities everywhere. Williams studied skateboarding in college and received a master’s degree in Public Diplomacy from USC. He is the first professor in the United States to teach the sport. “I am the first professor of skateboarding and action sports here in the U.S., especially at a major university, USC. I've been looking at how skateboarding can be used as a tool for cultural diplomacy. So, when it came time to bring the class together, they knew that I'd been working out in the field in Cuba and Brazil and South Africa and that we were trying to find new ways to engage youth all over the world. The course has proven to be popular among students. But Williams has kept the class size small, permitting just 25 students to officially register for the course. Examining skating as a tool for cultural diplomacy worldwide, Williams joined forces with the U.S. State Department, becoming the first skateboarding and academic sports envoy in U.S. history. “One of the things I'm the most proud of is being the first skateboarding envoy for the U.S. government. We worked with the embassy in the Netherlands to engage the Syrian refugees who'd been granted asylum in the Netherlands. It was an amazing project. And, not only was it engaging the Syrian refugees, but it was also engaging the youth of the Netherlands. Both of those groups are going to be the future of the Netherlands populace. Because the skateboarding diplomacy project was so successful in the Netherlands, the State Department has asked for Williams’s help in creating skateboarding projects in other countries. In addition to his work empowering and uniting skateboarding communities, Neftalie Williams is chairman of Cuba Skate, designed to create people-to-people exchange between communities in Cuba and the U.S.
“Cuba Skate is our nonprofit that's based in D.C. and here in L.A. and what we do is we bring boards back and forth to the kids that are in Cuba and we also promote educational exchange between the skaters that are here, skaters globally and the skaters that are in Cuba. A major issue in the Cuban skateboarding community is its growing female membership. However, Williams says there are a few barriers Cuba Skate faces. Neftalie Williams believe skateboarding teaches self-expression, among other things. Neftalie started in skateboarding as a teenager. He says he, and other neighborhood kids, chose skateboarding because bicycles were too costly. Williams says the sport has given him so much. He says he hopes his work in skateboarding and the community will help ensure that the next generation of leaders is smarter and more culturally aware. This week’s Teacher’s Corner provides students with the opportunity to practice using reported speech as part of an exercise on writing a newspaper article about a celebrity interview. Listening, writing (primary focus); speaking (secondary focus). Practice asking and answering questions as part of an interview news story. Print copies of the This Week’s Schedule worksheet in Appendix 1. Print one copy for each student. Print copies of the Reporter’s Notes worksheet in Appendix 2. Print one copy for each student. Begin the class by asking students who their favorite famous person is. This could include athletes, movie stars, authors, politicians, or scientists. Next, give each student a copy of the This Week’s Schedule worksheet in Appendix 1. Have each student fill in the schedule assuming the role of the famous person they selected in the think, pair, share activity. Encourage the students to be creative and provide as many details as they can to their schedule. Once all the students have completed their schedule, move to Part 2 of the activity. Begin this part of the activity by having the students put away the This Week’s Schedule worksheet they just completed. It will be used in Part 3 of the activity. Next, ask the class, “If you interviewed someone famous, what questions would you ask?” Have the students do another think, pair, share. As students share their questions with the class, write the questions on the board to generate a list of interview questions. Next to these questions, write the phrase follow-up question. Ask the students if they know what this term means. Reporter: Why are you visiting New York City this week? Celebrity: I am here to promote my new movie. Reporter: A new movie? What is it about? Give each student a copy of the Reporter’s Notes worksheet in Appendix 2. Have the students write down questions they would ask a famous person. They should also brainstorm possible follow-up questions to ask during the interview. Note: Students may be unsure what follow-up questions to ask. Encourage them to think of as many as they can. They may not use them all, but that is okay. One of a reporter’s most important jobs is to be prepared. Begin this part of the activity by having the students form pairs. Decide which student in each pair will be student A and which student in the pair will be student B. Have student A be the celebrity and instruct them to take out the This Week’s Schedule worksheet and fill out in Part 1 of the activity. Student B in the pair will be the reporter. Instruct these students to take out their Reporter’s Notes worksheet from Part 2 of the activity. Student B should also have a pen or pencil to take notes during the interview. Have students role play an interview with Student A (a famous person) answering the questions of Student B (the reporter). Remind the students that they will be writing a news story for homework so the reporter should get as many details from their partner as they can! After the pairs have completed the interview, have them switch roles. Student A should now be the reporter and interview Student B. Have the students take their Reporter’s Notes worksheet home and write up a short news story about the famous person they interviewed. Encourage students to use direct quotes and reported speech in their news story. Directions: Fill out your schedule with your plan for each day. Include what you will do, when you will do it, where it will occur, and why you need to do this activity. Directions: A reporter’s job is to ask specific questions to get informative answers for newspaper stories. You are about to interview a famous person. What questions can you ask? What possible follow-up questions might be helpful during the interview? Begin the activity by having students form small groups of 3 to 4 students. Each small group will form a news team. For the remainder of the activity, students will work in these news teams. Each news team will produce one radio broadcast. In their news teams, have the students brainstorm the types of stories they read in the news or listen to on the radio, such as international news, local news, sports, movie reviews, etc. After the news teams have brainstormed ideas, have them share their ideas with the class. As groups announce their list to the class, write them on the chalkboard. Once of all the ideas have been listed on the board, ask the news teams which of the types of news stories they find the most interesting. Inform the students that these news stories will be the ones they include in a radio broadcast. Topics could include international news, the economy, entertainment, sports, weather, etc. Have each news team vote on the news stories they want to include in their radio program. Note: Some topics of the news can be more challenging for students to write about than others, such as international news or business news. If these topics are too difficult for the students’ language level, the radio broadcast can be created with smaller topics. For example, instead of one story within the topic of entertainment, the radio broadcast can have two, such as movie news and music news. Once the news teams decide which topics to include in their radio broadcast, have them select a producer. The producer is responsible for organizing the radio broadcast and making sure the stories are written and submitted on time. The producer will act as the team leader for his/her news team. Once the news teams have decided which topics to include in the radio broadcast, have the news teams decide which student will write which topic. Once students know the topic they will write about, have them get out paper and a pencil or pen and begin brainstorming possible ideas for a news story. Encourage the students to write down a general idea at the top of their paper. Below this they should write down the “5 Ws and H” questions of a newspaper story: Who, What, When, Where, Why, and How. Each of these should be included in each story. Note: This brainstorming activity will vary depending on the topics of the radio broadcast students decided to include. Be sure to circulate around the room and help students brainstorm ideas. The news topics easiest to write will probably be local news, entertainment, sports, and weather. These topics are all common parts of American news radio broadcasts. In the entertainment section, possible story ideas are a review of a new movie or music album, a local performance occurring in town, or a story about the life of a famous celebrity. Note: For lower-level classes, students can work in pairs to write a story together. Instruct the students to continue the story-writing exercise at home as a homework assignment. For this activity, be sure to set a longer than normal homework deadline, such as one week. After you give the homework assignment and the due date, it will be the responsibility of the news team producers to make sure students complete the homework! After the students have completed their homework, begin this section of the activity. In this part of the activity, the students will organize their radio broadcast, practice reading it, and record it for a homework assignment. Begin this section of the activity by having the student gather into their news teams. In their news teams, students should read the news stories written by their classmates in their news team. They should then select the order in which the stories will be read during the broadcast. Remind students that they want to choose an interesting or exciting story for their lead. In American journalism, the lead is the first and most important story in a newspaper or on a radio broadcast. Once the news teams have selected their lead, have them decide the order of the remaining stories for the radio broadcast. Note: Many American radio broadcasts follow a similar pattern; they begin with local news, then international news, then weather, and conclude with sports. If teams are having trouble organizing their radio broadcast, suggest they follow that pattern. Once the news teams have decided the order of their stories, have them practice reading their stories out loud. Each student in the news team should read one news story in the radio broadcast. Homework Activity: For homework, have students record their radio broadcast. If students are feeling creative, encourage them to record and edit their radio broadcast using a free audio editing tool such as Audacity. Optional Activity: Once each news team has recorded their radio broadcast, have them share their recording with the rest of class for other students to listen to for extra listening practice. For more ideas on creating audio recordings for the classroom, check out the webinar: Podcasting in the Classroom. For more ideas on using news in the classroom, check out the March 2016 Teacher’s Corner.